Home :: Antennas :: Outdoor Standalone Antennas :: Sector antennas :: ARC Wireless 4.9 to 5.9GHz at 18-13.5dBi Standalone Variable Degree V Pol Wideband Sector Antenna with N-female jack - New! ARC Wireless 4.9 to 5.9GHz at 18-13.5dBi Standalone Variable Degree V Pol Wideband Sector Antenna with N-female jack - New! Field adjustable with a mechanical slide from 35 to 130 degree horizontal (AZ) beamwidth. Easy to change. No tools required. Vertical (EL) beamwidth is fixed at 7.5 degrees. 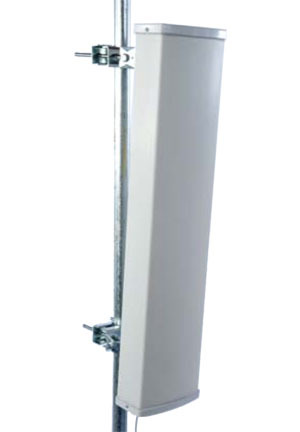 The super heavy duty bracket system is easy to install and adjust for downtilt. DC Ground for lightning protection. Mikrotik mANTBox 12s RB911G-2HPnD-12S 2.4GHz 12 dBi 120 degree Dual Polarity Sector antenna with integrated Radio - New! Mikrotik RouterBoard RB4011iGS+5HacQ2HnD-IN (Export version) Powerful 10xGigabit port router with a Quad-core 1.4Ghz CPU, 1GB RAM, SFP+ 10Gbps cage, dual band 2.4GHz / 5GHz 4x4 MIMO 802.11a/b/g/n/ac wireless and desktop case - New! Mikrotik RouterBoard RB4011iGS+5HacQ2HnD-IN-US (US and Canada) Powerful 10xGigabit port router with a Quad-core 1.4Ghz CPU, 1GB RAM, SFP+ 10Gbps cage, dual band 2.4GHz / 5GHz 4x4 MIMO 802.11a/b/g/n/ac wireless and desktop case - New! ARC Wireless 2.1 to 2.9GHz at 18-14.5dBi Standalone Variable Degree V Pol Wideband Sector Antenna with N-female jack - New!